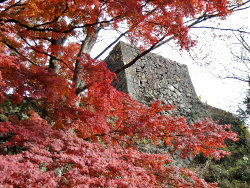 Yonago Castle is classified as a hilltop castle, and is located in Tottori Prefecture. During the pre-modern age, it found itself within the borders of Hōki Province. It is associated with the Kikkawa, Arao clans. Dates in use: 1470 - 1871. 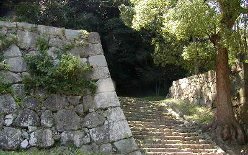 The ruins of Yonago castle are situated atop a hill and borders a river & the ocean. It is a prime example of the environment being utilised to enhance a castle's defences. Several battles were fought here prior to the Battle of Sekigahara in 1600 but it lived out the rest of its days relatively uneventfully. Like so many other castles, all of its buildings were torn down during the Meiji period. 1467 The Yamana clan built the first fortifications atop Mt. Iiyama. 1524 The Amako clan seized control of the castle. 1562 The Mōri clan ousted the Amako clan and re-instated the Yamana clan. 1569 The castle fell to the Yoshikawa clan. 1591 The Yoshikawa clan were in control of the castle & started a large-scale renovation of the castle. 1600 The Yoshikawa clan were transferred to Iwakuni & were replaced by the Nakamura clan. 1601 A five-layer main tower was built along side an existing four-layer turret. The entire castle was completed the following year. 1610 The Katō clan were transferred here. 1617 The Katō clan were transferred to Ozu castle. 1632 The Arao clan were transferred here. 1872 The castles grounds were granted to the former samurai of the fief. 1880 The main tower and turrets were torn down.